Dirk Naudts and his wife Saskia Waerniers established De Proef Brewery in 1996. From the beginning the idea was to produce some of their own beers, but also to produce beers on demand for those who were trying to get breweries started and for beer parlors that wanted their own distinctive house beers. It was a brilliant idea — they created a state of the art brewery and in only a few years produced literally hundreds of unique beers. Tim Webb, author of CAMRA’s Good Beer Guide to Belgium, the only author to rival the beer author Michael Jackson’s understanding of Belgian Beers, essentially threw up his hands because so many of the beers were so good. To catalog them all would be a separate guide. Mikkel has produced something around 2,000 beers in his wanderings — you can taste hundreds of them in his bars in Copenhagen, but he seem to hit his stride best during the holiday season. His beers are rich, big and boozy and adventurous. Like most of his beers the one we’ve chosen from our archives was a one-off, we believe. But you can certainly find something as interesting lingering on the shelves of good beer stores. There’s a good chance what you find will have come from the new San Francisco brewery (actually it’s not that new — it’s the original AleSmith brewery), but there are still plenty of De Proef versions around as well. For a review of a Mikkeller beer from their US brewery, click here. The Beer— Especially in 2012, this was an audaciously hopped IPA, but ginger & pine defuse the managed to citrus. A firm pale malt almost stands up to it. A sipper for sure, though it’s 7.8% ABV is pretty modest by holiday standards. Value — Good. It was close to $14, but it came in a 75 cl bottle. 12 DAYS OF CHRISTMAS #6: Birrificio L’Olmaia Christmas Duck, S. Albino, Italy from State Line Liquors, Elkton, Md. The Beer— Even and vinous dark ale with a fullness consistent with its 8% ABV. Some residual honey adds some floral notes to a surprisingly mild ale. If you’re rich, it’s yummy in a sort of quiet way. If you’re not rich, you’ll be clawing at the glass to find the flavor you thought you paid for. Value — Fair. It was less than $20 but not by much. It’s not the store’s fault, though, and it’s not the brewery’s fault either. In the US, smaller brewers are taxed at a lower rate per barrel because their costs per barrel are so much higher than the big boys. In Italy, the small brewers are taxed much higher per barrel because their influence in the government is so much less than that of the big boys. We hope that will change when the government wakes up to the fact that the more that one thousand craft brewers in Italy provide far more jobs than the big brewers. Yes. We hope for a lot these days. The Story— We attended college in nearby Clinton, New York, and that’s where we learned to both appreciate beer and to savor the differences between different brands and styles. Other than the occasional renegade fling like Matt’s Maximus Super (called by nearly everyone who experienced it “Maximus Stupor”) beers were pretty much beer, differentiated for most drinkers by brand loyalty and price. By the end of freshman year, though, I could tell the difference between Utica Club’s Cream Ale and Genesee’s. for the record, Utica Club’s version had a bit more taste, was cleaner, and left you much happier the next morning. FX Matt was a large regional brewery at the time, at one point running breweries in Florida and the West as well as its four million barrel plant in Utica. But its flagship Utica Club lager suffered from the same tilted playing field that doomed so many other regional stalwarts. Anheuser Busch waged war against Miller and Schlitz and the victims were the small guys who couldn’t match the cut rate prices. Somehow FX Matt hung on. Matts, a premium lager, was a cut above the big boys’s yellow suds and Utica Club had enough local loyalty to keep the brewery from going under. It’s salvation came after a series of major contract players such as Sam Adams and Brooklyn brewery used the enormous excess capacity to brew beers for the emerging craft market. Eventually the Matt family got smart and re-branded themselves as Saranac, brewing beers of their own similar to those that they had been brewing for others. The timing was perfect and now Matt/Saranac had the advantage of economies of scale as their enormous 500 barrel brew kettles could churn out all the respectable craftish beers they could sell. Saranac continues to produce beers that challenge the notion that breweries have to have small kettles to make good beer. They won’t produce a Goose Island Bourbon Country, but their big strong dark ales give it a run for the money– and some of the seasonal beers are genuine bargains. One of the best is a fresh hop beer featuring local hops picked by volunteers. Rudy’s Spiced Christmas Ale is another beer that could masquerade as a product of a much smaller brewery. Value — Very good. A great beer to take to a party with people who are going to talk more and think less about what they’re drinking. It will neither embarrass you nor break your bank account. A reason to be thankful to live in the Mid-Atlantic region is access to Tröegs’s whimsical yet brilliant brewery in Hershey, Pa. There’s lots to do — drop off the (older) kids at Hershey Park just up the road and settle in for a fabulous tasting. The brewery is designed for tours — the guided tour leads you safely through the heart of the brewery and the quicker and easier self-guided tour shows you many of the highlights while you sip on your beer. Tröegs brews a wide range of beers that include one of the country’s best pilsners, but also range to remarkable powerhouses. 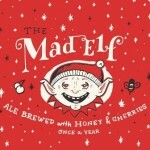 Mad Elf is an 11% spiced ale that fans eagerly await each year. It can sell out quickly in the area near the brewery, but it’s not hard to find in good beers stores elsewhere in the Mid-Atlantic. The brewery sells a wide range of their beers — including the Mad Elf– in their gift shop, but you can find them at lower prices in nearby super markets and distributors. The recipe remains the same, but the beer still shows some variation – hops and malt do vary from year to year in much the same way that grapes can vary. the brewery doesn’t make a big deal about vintages, but they’re clearly marked on the neck label — the release year is one year earlier than the “best before.” I’ve enjoyed the Mad Elf more each year over the past half decade. This year’s version is the best yet. If my favorite beer of the year weren’t a Munich lager, I’d guess my palate is getting older and eager for excitement, but I suspect they really have found ways of nudging a very good beer into a great beer. The Beer— The 2018 version has magnificently blended rich malt. Cherries and honey can’t begin to be the cause of the breadth of flavors; the yeast suggests some traditional Christmas spices. The fruit is so integral I had to recheck the label to see if it really was added rather than a natural result of the malt and hops. In short it’s a masterpiece where the non traditional ingredients softly supplement rather than kneecap the depth of the malt and yeast. Remarkably, the 2017 version was even better. Redder, deeper and with more staying power, it was chewy, fruity and even slightly husky with some herbal notes developing. Honey has stepped back a bit and the cherry notes are deeper. We rate “ageability” on a 1 to 5 scale, where 3 doesn’t hurt, 4 shows some improvement and 5 is “don’t drink it, save it!”. This one got a 4.5. If you can get a six pack, drink some now, but definitely find a cool dark place to lay this down for a year or two. Value —good to very good. They know what they’ve got and don’t give it away, but it’s a special beer and worth the outlay. La Trappe beers are the modern marketing label for the Koningshoeven Abbey, founded on farmland in 1881. The monks quickly added a brewery to pay for expansion of the abbey — which started in a sheep barn and the strategy worked. A dalliance with Stella Artois began in 1969 and, happily for craft fans, ended in 1979. A modernized brewery followed shortly after. It spelled the end of the historic open fermentors, but ensured a production capacity that can come much closer to meeting demand. The Beer— Hugely complex. Smooth cherry fruit and toasted malt with a sweet wood foundation. We rated it well into the top 1% of beers we have tasted. Value — Very good. Maybe a steal, really, at $8.75 for a good sized draft of this 10% marvel.